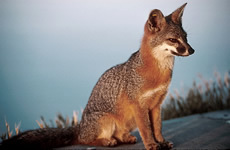 The island fox, also known as the channel gray fox, is a descendant of the mainland gray fox. It is native to California in the United States. It has six subspecies, each unique to the island where it is found. It shares the same genus Urocyan as its ancestor, the gray fox and is a member of the family Canidae. The island fox is a third the size of the mainland gray fox and is about the size of the domestic cat. It has a body length of about 17 to 21 inches and weighs about 2.0 to 6.6 pounds. It is grizzled gray on its back. The sides are rust-colored while the ventral side is white. Its face is distinctively patterned with rufous, white and black colorings. Its tail possesses black stripes on the upper side. It is usually active during the day due to lack of disturbances in the islands. It is known to be a solitary animal unless when breeding and can live up to 15 years of age. The island fox feeds on small mammals, birds, reptiles, insects, eggs and fruits. It is generally located in all habitats found within the Channel Islands such as sand dunes, beaches, grasslands, marshes and pine forests. It also lives in developed areas. However, the island fox has a preference for sand dunes. In California, the island fox is found in San Miguel, Santa Rosa, Santa Cruz, Santa Catalina, San Nicolas and San Clemente islands. Mating occurs from the months of January thru April. Mating pairs usually remain together for life. The female gives birth to a litter of one to five kits after a gestation period of 60 to 65 days. The kits are born blind and helpless with dark brown fur. After about one week, the kits are weaned. They attain sexual maturity when they are one to two months of age. The island fox is not usually exposed to diseases from the mainland making it very susceptible to any disease when exposed. The "canine distemper" virus has been a major threat to the species especially in South California. Another major threat is the high rate of predation by the non-native golden eagles, particularly in Santa Cruz, Santa Rosa and Santa Miguel islands. Repeated number of collisions with traffic has also led to their decline. In 2004, the United States Fish and Wildlife Service listed the island fox as "endangered" through the Federal Endangered Species Act. Actions that have helped reduce island fox decline include development of vaccines against the canine distemper virus, relocation of golden eagles, recovery of a larger ecosystem, and breeding captured island foxes to increase their number. All these have helped to continue stabilizing the island fox population. Copyright Notice: This article is licensed under the GNU Free Documentation License. It uses material from the Wikipedia article "Island fox". Glenn, C. R. 2006. "Earth's Endangered Creatures - Island Fox Facts" (Online). 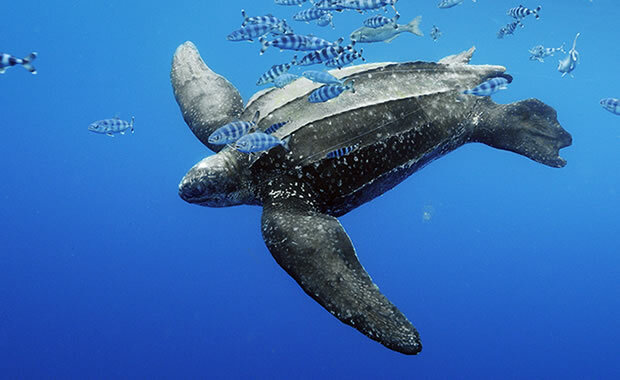 Accessed 4/24/2019 at http://earthsendangered.com/profile.asp?sp=651&ID=9. Need more Island Fox facts?